Asking for more budget dollars is about as popular as asking for a raise; nobody wants to be the messenger, but everyone wants to be the recipient. Regardless, when you need that budget increase, you’re going to have to ask. The key lies in doing your homework and presenting your argument well. Here are five steps to guide you in building your case for a digital marketing budget increase. Have you ever googled something and seen an overview of information about the topic show up next to or above the standard search results? If so, you’ve seen a knowledge graph. These graphs are Google’s way of answering searchers’ questions directly so no one needs to surf the web for answers. These graphs, when they’re about businesses, can contain contact information like location, hours, phone number, and web address, reviews, menus, and more. 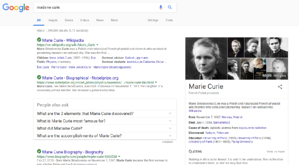 So how can you make sure you’re showing up when people are searching, and when your knowledge graph does appear, that it’s showing the correct information?